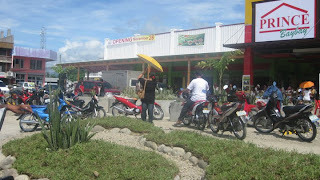 Warayblogger.com: What Businesses in Baybay City, Leyte Accept Credit Cards? What Businesses in Baybay City, Leyte Accept Credit Cards? Greenware Customized Systems and PC Accessories. It's a computer store located at Prince Baybay. Prince Baybay -- is the biggest store in the city. Panny's Bakeshop, which sells cakes and pastries, and Rose Pharmacy have also their own stalls inside the building. Aside from credit cards, Prince Baybay also accepts debit cards. Greenware, Mercury Drug, and Prince are located at A. Bonifacio St., Baybay City, Leyte. This blog is my top favorite blog which i visit regularly to keep me up to date from its posts. I've visited many blogs but this blog impressed me lot and I'll keep visiting this blog. What about Dettie Panis? Hmm.. my nkita ako na sign ng Visa sa knila. Not sure if visa o mastercard. Mejo napadaan lang.